Even though some may interpret what I will recount as negative, it is not intended that way. I believe that to understand India, you need to travel by train at least three times with at last one overnight train. It really teaches you humility, patience and gives you a greater insight into Indian life. 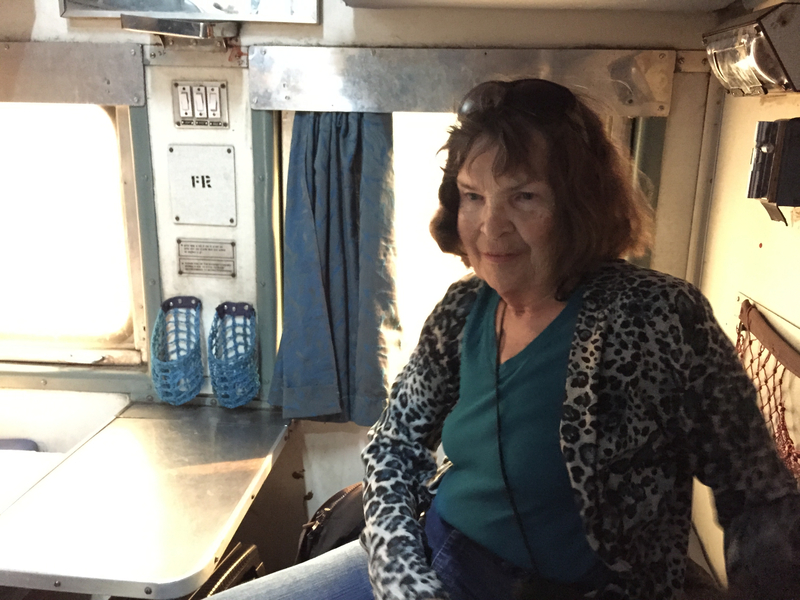 With my niece, Lenore, we traveled a day train from Delhi to Agra. In India you cannot enter where the train platforms are without showing your ticket and putting all baggage through a security check. One line for men to be scanned and a special line for women who are scanned in a small curtained booth by a woman. We got our introduction to how to get to our platform. From large cities like Delhi you have to flex your stair stepping muscles. That is walk up the equivalent of three flights of stairs, then walk along a Bridge until you find the correct platform and proceed down the three flights–all this while dodging people stopped and being bopped by others’ bags and backpacks. Sometimes these stairs are replaced by an extra steep ramp. In the end, I preferred the stairs. 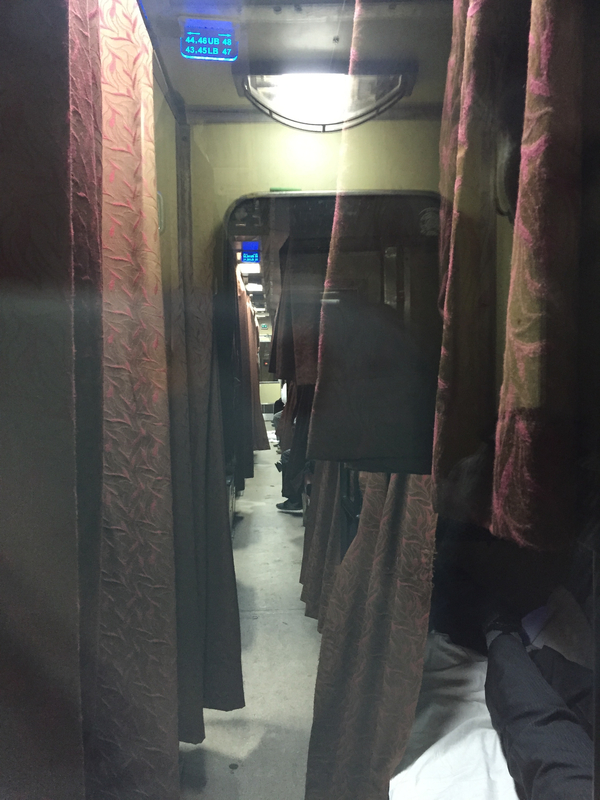 For our Agra to Varanasi night train, Lenore and I got to the Agra station at 10pm for a departure scheduled at 10:40pm. We were fortunate to find a place to sit as we waited until the train left at about 3:50am. It was as if we were in an accepting zombie state. The train lost more time after its departure. We ended up being over seven hours late. Whereas we were to have had a day time arrival, we got to our hotel about 7pm after dark. It was somewhat unsettling. Varanasi proofed to be such a beautiful and fascinating city that all was worth it. The thought of taking a night train from Varanasi to Delhi and making a connection to Jaipur seemed unwise for me what with so many trains being late. So I found an easier way. 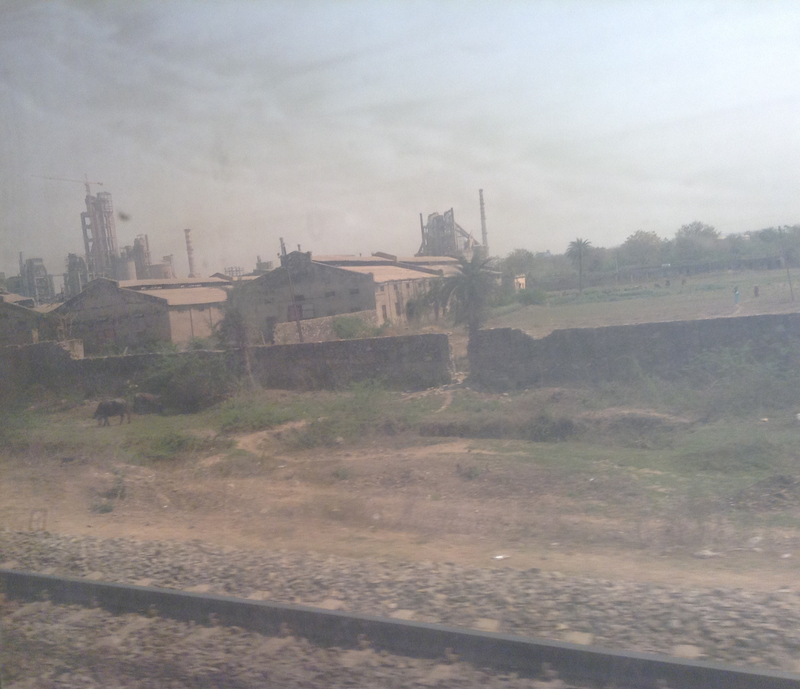 I took a flight from Varanasi to Delhi and made connections on to Jaipur. The flight was most impressive as was the on time departure and arrival. More on that later. 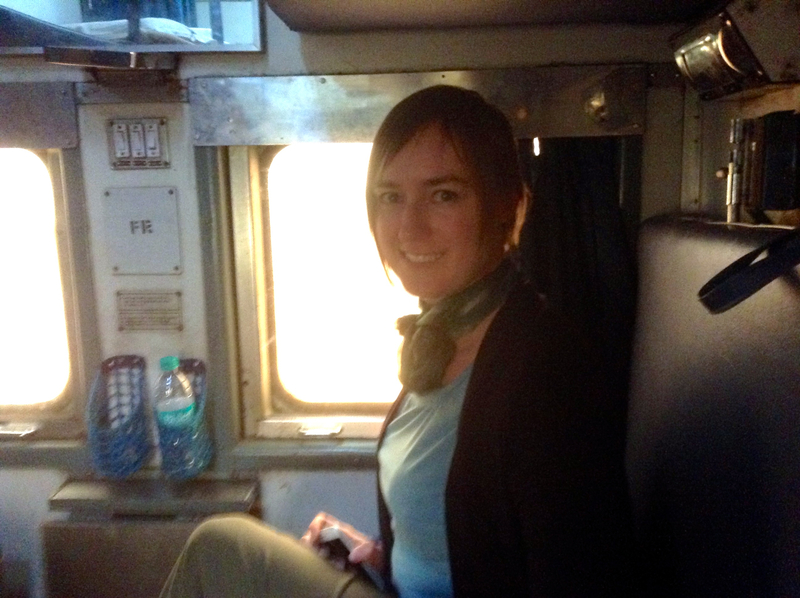 After enjoying beautiful Jaipur, I got my train stamina back and booked a 6:40am train from Jaipur to Udaipur. I arrived at Jaipur station with plenty of time to spare. However, I nearly missed the train as platform 2A was not in sight when I came down the steps to the platform. It was literally about 3 blocks off in the distance. I was in the chair car. Posted outside all train cars are the names of those reserved and their seat assignments. Fortunately mine was listed as Janet T in seat 60W. Two minutes after I boarded the train, it departed. There were many of us who nearly missed that train but those in the know had taken all the shelf space for baggage. I was able to squeeze my rolling backpack between my legs and the seat in front of me and held my day pack on my lap. It was fine. The legroom between each row of seats was quite adequate. I was even able to get out of my window seat without the man sitting in the aisle seat moving. You can’t say that for most airline seats. Fortunately one thing you can always count on is the offering of chai on the trains. A vendor comes thru with a large thermos container and small paper cups. It is sold for 10 rupees so I was able to have a cup of chai soon after the train departed Jaipur. I was quite hungry so at 11am when a food vendor came through I ordered the vegetable cutlet. I ate one of the two but decided against the packaged sauce and the two slices of bread. I was delighted to have the chai after the meal as well. 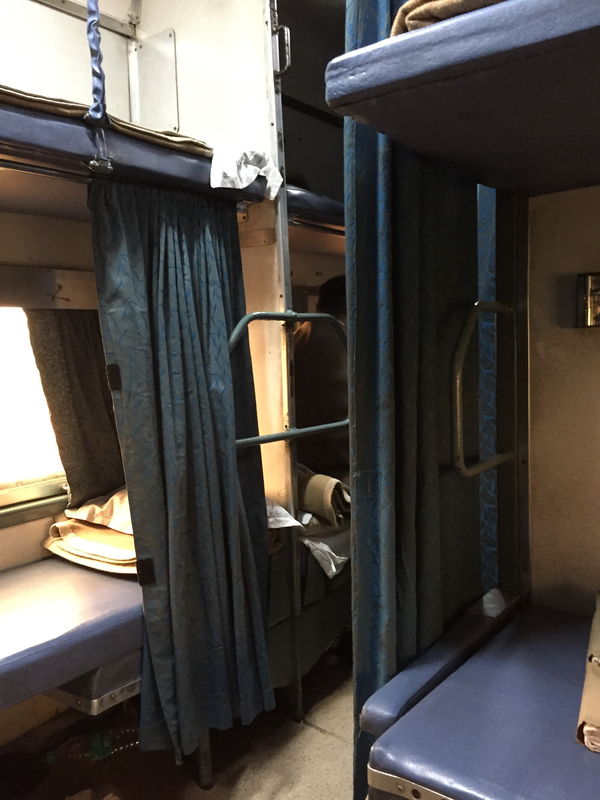 I was somewhat apprehensive about taking a night train from Udaipur back to Delhi as I was reserved the middle of a three berth tier. The three berth tier does not allow for those on the bottom or middle berth to sit up. I was fortunate that when a couple boarded and stated they had the two bottom berths and would gladly change with me so I could have a bottom berth. I did not ask but was greatly relieved. Here is what the aisle looks like at night. 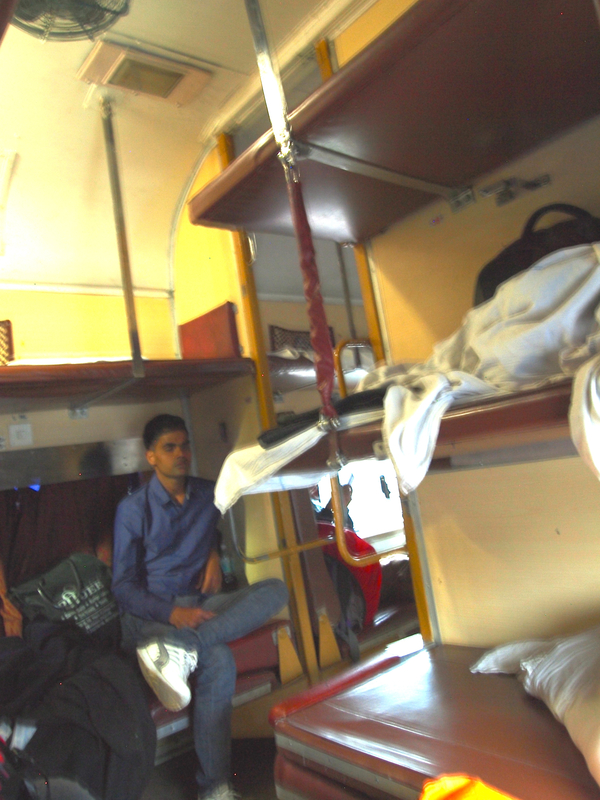 So climbing down the ladder from the middle or second or upper berth into the aisle could be challenging. I met and spoke with two young women from China who had the upper berths across the aisle from me. One thing I love about the trains is just when you want to have a better taste in your mouth, you hear, “Chai, Chai.” I have had multiple small cups of chai on trains. On the train from Udaipur to Delhi, I have had only one and that was at 6 am. It is reassuring to know there will be more calls if I am so inclined. Be prepared with lots of 10 rupee notes. Always take double the water and food with you. Eastern and western Style toilets at the end of each car. Trash bin outside the stall. 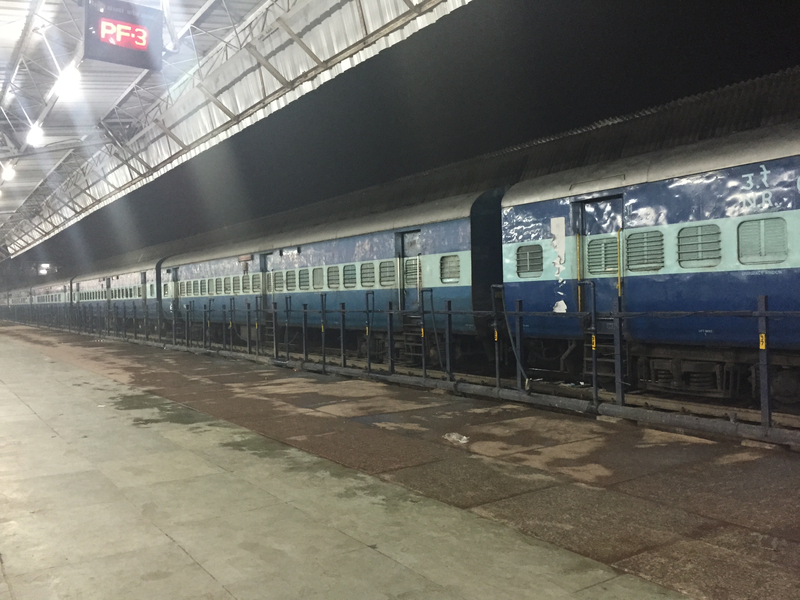 When I arrived back in Delhi on March 1 on the overnight train from Udaipur, it was pouring rain. Just before panic set in as to how I was going to navigate getting off the train with my now two heavier bags plus my day pack, a man with a red turban and beard appeared wearing a bright blue shirt and green pants and offered to be my porter. He carried my rolling backpack on his head and bright blue bag of new treasures over his arm. He led me up the three flights of stairs to a bridge over all the train lines and then down the three flights to exit the station. It was raining very hard and the street seemed like a river of water. Then into a cab to head for Balaji hotel. I thanked my red turbaned genie for his appearance and assistance . All in all the train ride had been great. Of course I had my morning cup of chai before dawn. Did I mention that I am having the time of my life? Just in case you had not noticed, I totally love India. It has met and exceeded all expectations. Things are very different in India but with after a while I get with the system. Three weeks is not long enough. Problem solved— I will return. Thanks to my niece for providing additional photos to complete the train picture. 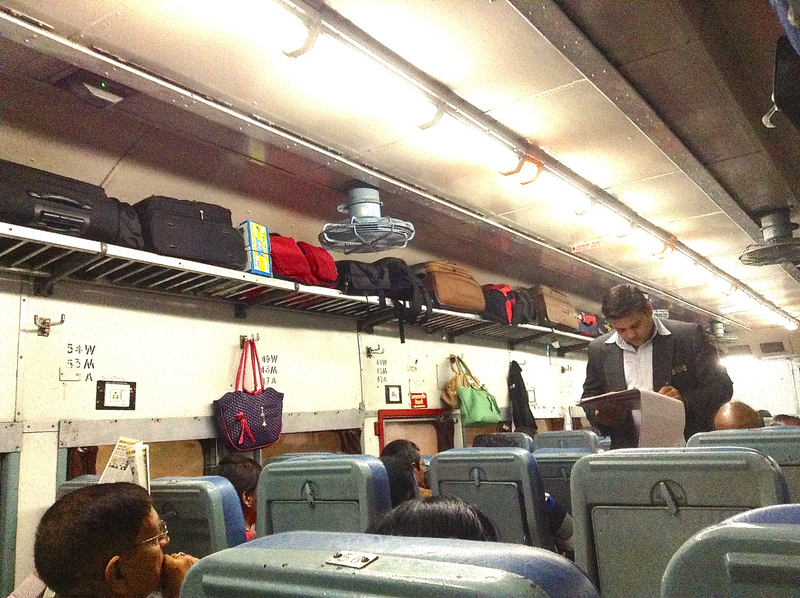 Gallery | This entry was posted in Contempory, Experience the Moment, love of life, The Art of Indian Train Travel, train travel, travel, Travel in India and tagged Acceptance, Be prepared for anything, Chai anyone?, Indian Trains. Bookmark the permalink. thank God for chai: Indian tea, needed to get through all the people and manage stairs with bags: I know you found it great fun but I recall it was hard at times. Then the down side: millions of slaves paying off a debt to their masters, by working for him: probably the porter was a slave to someone on the railroad staff. It i sbest to ,as you say, get in a semi zombie state, have patience: because trains are late, and sometimes you are not on the right Platform. Not for the fragile, dear India. I had no idea that you had been to India before. I am glad you went because you can relate to my stories. For years I was aware of the poverty there and I did see it but not to the extent that I had expected. Further along as my stories come forward, you will see how I met a number of people who are sincerely try to make a difference in the lives of the impoverished. Wow, great to read your travels in India! Always good to read an outsider’s perspective! 🙂 I see you have lots of parts, will get to them leisurely. Good that you enjoy Indian chai. Not a big fan here! Been to South India? No. Not yet. I want to. This year was my first ever trip to India and it was short — 3 weeks. But I so loved it. I will write about Udaipur and Noida artists soon. Oh that’s good to hear. Being a southie, I’ve never visited much of the north. So looking forward to your posts. I’ve only been to the Taj Mahal! 🙂 That’s a marvelous place to be. It is quite amusing that a man I know here in the USA who is of East Indian descent was shocked to hear that I took the trains in India and thoroughly enjoyed them. He told me that his family does not allow him to ride the trains. I was rather non plused by that. I am not sure what the reason could be. But I am so glad I did.